The use RootMetrics data provides current or future T-Mobile customers with an opportunity to easily compare coverage in the markets the company has gathered independent data. Current data point locations include Baltimore, Boston, Chicago, Dallas, Houston, Los Angeles, New York, Philadelphia, San Francisco, San Jose and Seattle. 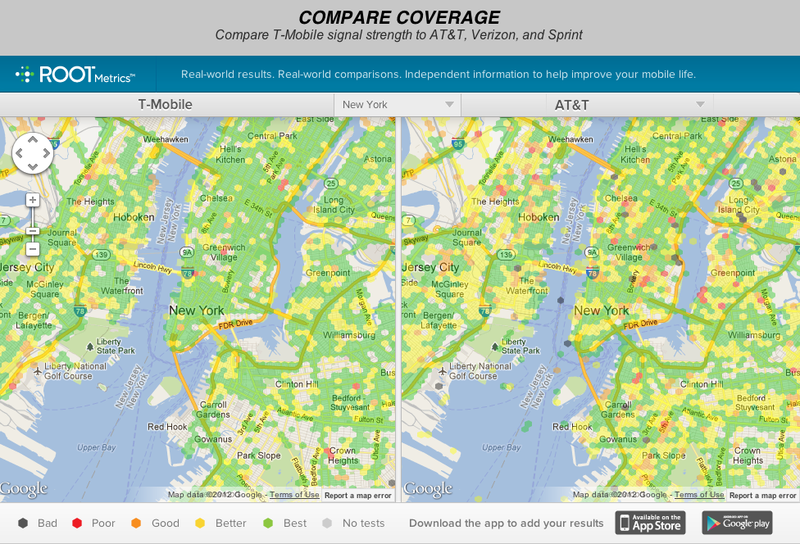 Compare T-Mobile’s coverage to other carriers with an independent, crowd-sourced map from RootMetrics. RootMetrics coverage maps are populated by people like you who have installed the RootMetrics app, as well as RootMetrics scouts. Comparison map displayed shows voice signal strength. Comparison map results may show gaps in coverage if no one has reported from that area. To see complete T-Mobile voice and data coverage visit Personal Coverage Check. RootMetrics is a well-known face around TmoNews as their most recent study concluded in September of this year highlighted that T-Mobile’s HSPA+ 42Mbps network faired incredibly well against the likes of Verizon and AT&T’s LTE networks. With the hope that both companies will add more locations in the future, the addition of these maps offers new opportunities for T-Mobile customers to properly judge coverage basic on the experiences of folks like you and me. ← Blockbuster Video Stores To Begin Selling T-Mobile, Sprint And Verizon Phones? You might want to look at the coverage in the Midwest a bit closer. Minnesota, despite being largely rural, is quite well covered. T-Mo has greatly expanded their native coverage in IL/MO/WI. Iowa, well, that’s mostly covered by iWireless. Oddly, iWireless was (is?) 49% owned by…T-mo. all that i learned is t-mobile has comparable coverage in the largest city in our country…. too bad in Philly (4th largest T-mobile market) my phone never sees over 5mbs download. I get 11mbps download and 3mbps upload in NE/Philly on my iPhone 5. Wait till they complete the all transition of frequencies. Is anyone else finding the app a bit laggy? Still very useful though, I’m about to buy a home, so at least I know what I’m getting into. Says the area around my house where I’m lucky to get EDGE is a mix of “Very Strong” and “Good”. I’m sorry if I can pull down a signal outdoors it’s neither of those. LOL it also says that a road I regularly ride my motorcycle on is solid “Excellent” where you can’t get any reliable signal on TMO, AT&T or VZW for the vast majority of the road. You can download their app and upload test results. I noticed some oddities with what the map said versus what I was getting. Once I did some testing I noticed it showed up on the map when I checked it again at the end of the day. Seems pretty cool to me, especially the background testing on Android. I’m sure the signal probably depends on the device. Few data in my area. Hmm, so my immediate neighborhood in Brooklyn is showing 3/4G strength as excellent all over, which it generally is. But there is this 1-2 square block area that has really bad coverage for some reason, yet it still shows as excellent on the map for 3/4G. It does show Good for 2G, which would be more accurate, although I’d probably say only Satisfactory at best. I know T-Mobile says they cover 220 million people. Last I read, there are over 300 million people in the US. So I guess they only cover about 2/3 of the country’s population. Edge is practically useless, lets be honest. You really need the 4G (HSPA+) for T-Mobile to be of any use. I wish T-mobile would also do their 3G refarm for all the areas besides the urban ones. I realize upgrading cities covers more people more quickly for the beloved iPhone, but I’m a current customer and as soon as I drive out of town onto a major highway, I can barely get the phone to work. Data is too slow for things like Google Maps to function either. We temporarily live in Issaquah, WA and drive right past corporate headquarters for T-Mo every day. And have at most 1 bar in the area where it says excellent coverage. There’s just something wrong with having no signal by the bloody HQ. I have an SGS3 and he has a Lumia 810. Even standing outside he hasn’t had above 3 bars. Yet back in OKC we had excellent coverage. Sigh. Certainly is an interesting insight to the coverage areas.